Despite living in an ever progressive digital world, more and more organizations are implementing carpet graphics in their indoor marketing and advertising strategies. When used together with banners, POS displays, wall coverings, window film and more made from digital print media distributed by Ultraflex Systems, carpet graphics can help reinforce brand recognition the minute someone walks into a restaurant, hotel, car dealership or other business. Ultraflex Systems is proudly recognized as the industry’s leading innovator, developer and supplier of exceptional wide-format PVC and canvas material, textiles, carpets and specialty substrates. Artex Canvas is a printable canvas material that is also featured in our Specialty Materials Line. 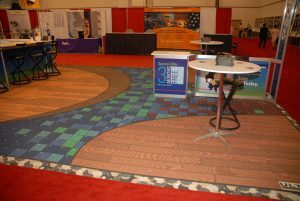 This media is often paired with carpet graphics for complete indoor branding coverage. Artex Canvas, UltraCanvas Economy S205 and other canvas material in the various Ultraflex Systems product lines are best suited for indoor applications, such as tradeshow displays, wall coverings, banners and art reprographics, and are often paired with UltraCarpet Extra for full coverage marketing campaigns. Ultraflex Systems media specialists in the US and elsewhere worldwide are on hand to help clients choose the products in our lines that are best suited for both their needs and budget. Technical data sheets, fire certificates and more are available for all of our products. Carpet graphics and other media samples are available for testing and/or educational purposes, and more than 100,000 rolls of media are in stock in our five North American warehouses to ensure fast order processing and shipment. Contact one of our courteous associates today with sample or quote requests.